We can combine ways depending upon the need. To keep things simple here we made a simple Medicine Reminder Using Arduino which reminds to take medicines 1 or 2 or 3 times a day. The time slot can be selected using push buttons. Also, it shows current Date and Time. We will further extend it to a IoT project in coming articles where a email or SMS notification will be sent to user. This medication reminder can also be integrated with Patient Monitoring System. 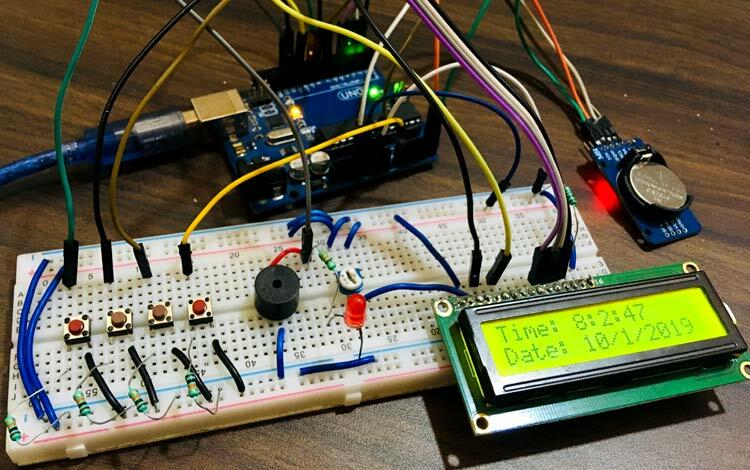 In this Medicine Reminder Project, RTC DS3231 is interfaced through I2C protocol with Arduino Uno. You can also use RTC IC DS1307 for reading the time with Arduino. RTC DS3231 also has inbuilt 32k memory which can be used to store additional data. RTC module is powered through the 3.3V pin of Arduino uno. A 16x2 LCD display is interfaced using SPI. A buzzer is used to alert and remind that it’s time to take medicine. Four push buttons are used where each has distinct select feature. The first push button is used for reminding to take medicine once per day. The second push button is used to remind twice per day and the third push button is used to remind thrice per day. The fourth push button is used to stop the buzzer when user has heard the alert. The Pill Reminder Alarm is powered using 5V supply. When it first boots up, it shows a welcome massage as “Welcome to Circuit Digest”. The LCD screen is set to cycle in three screens. The 1st screen shows massage as “Stay Healthy, Get Well Soon”. The second screen is a help screen which tells to press select push button to select any one time-slot to remind (once/twice/thrice in a day). The time slot is changeable in program and can be configured accordingly. Right now we have fixed this into three durations i.e. 8am, 2pm, and 8pm. We have divided time slots into three modes. Mode 1 selects to take medicine once/day at 8am when user presses 1st push button. Mode 2 selects to take medicine twice/day at 8am and 8pm when user presses 2nd push button. Mode 3 selects to take medicine thrice/day at 8am, 2pm and 8pm if user presses 3rd push button. We can also add a feature to snooze the buzzer for 10 minutes (not included in this project). When user selects desired slots by pressing push buttons, the user input is recorded and the time is taken from RTC. When time is matched with selected time slot then the buzzer starts buzzing. User can stop the buzzer by pressing STOP button. The same process continues for the next slot reminder. Complete process is shown in the Video given at the end of this aricle. We can change the program and hardware if we want to add more features. To understand in much simpler way, we have broken down program into small functions. The functions are easy to understand and implement. The complete program is given at the end of this project. Let’s start with the program. The EEPROM library is used to keep the track of user select input if Arduino is not turned on. And when user power on the Arduino it gets the previous state of push buttons using EEPROM library. The Wire.h library is used since the RTC DS3231 module is communicated using I2C. Always check if the RTC is properly wired or it is not damaged, since RTC will play an important role in time keeping of the whole reminder system. The time adjustment can be done in two ways, either automatically using system compile time or by entering it manually. Once we have set the time, comment the below lines unless you want to change the RTC time again. This switch statement is used to read the previously saved state of the push button and resuming the state for appropriate and accurate reminder time. This statement is used to get the millis to use for timing and control of the defined interval screen cycling. Start reading the digital pins connected to push buttons. Below function is used to read the push button state and write it to EEPROM. Whenever the push button gets pressed the state is written to EEPROM. Also it prints the message on LCD display of the selected user input choice. Similarly the functions push2() and push3() is used. Below function is used to stop the buzzer and led. It is always good to give suggestions. Print a suggestion message on display “Take medicine with warm water”. The below function is independent of the time keeping but always cycles in three screens which helps user. As we are keeping a care to patients lets print a greeting message as we know that emotional support is very helpful in healing patients in more quick time. You can choose your own creative message. Let’s print a message as “Stay healthy, Get well soon”. The second screen is for giving instruction to patients as “Press buttons for reminder..”. The Third screen is used to simply show current date and time. if (isScreenChanged)   // only update the screen if the screen is changed. This function is used to start buzzing and blinking the LED simultaneously if the selected time has reached. This function is used to compare the user selected time slot at 8am and starts buzzing the buzzer and blinking the LED until user presses the stop push button. Similarly the functions void at2pm() and void at8pm is used to start buzzer and led at 2pm and 8pm. This is how you can simply make your own Automatic Medicine Reminder using Arduino. You can also use ESP8266 with Arduino to make it an IoT project which will be able to send email alert to the user. if (isScreenChanged) // only update the screen if the screen is changed. Not working LCD give me Back. LCD is working but according to code instruction the LCD is not showing reminder, let me what can i do?